This was the 8th year for this event, and by far, the largest collection of athletes to battle it out for the championship. Twenty three athletes, from all over the world, were here in the first IFBB pro show of the year. Oh my God – what a lineup! Over 20 top athletes compete in the biggest show of muscle in this history of the IM Pro!. Pre-judging started at 12 o clock, but by 11, there were already 300 or so fans outside the doors waiting to get in. Backstage, there was nervousness, and intense concentration by the athletes, as they prepared themselves for the event. During pre-judging, there were four parts. The first part introduced all of the athletes, half of them lining up first, and second half a couple of minutes later. The second part consisted of the first call outs, in which the judges compared athletes to each other, three at a time. The third part consisted of each athlete come on stage and go through a routine, consisting of 7 poses. 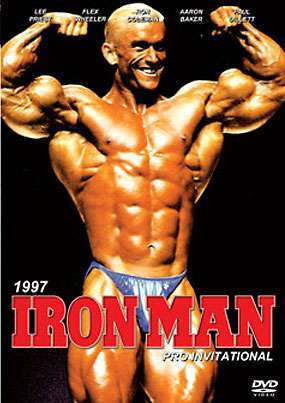 There were, in order, Front Double Bicep, Front Lat Spread, Side Chest, Rear Double Bicep, Rear Lat Spread, Side Tricep, and Abdominals & Thighs. The fourth part brought out the final call outs of the pre-judging. This is where you could really see the differences between the top stars, and judge on who will win based on symmetry, muscle, and overall appearance. The call-outs were as follows, in order, three athletes being compared at a time. The prejudging ended and the audience went home or to lunch to await the evening show. Backstage, the athletes were tested for diuretics. The evening show started at 8 pm. There was a crowd of over 1,500 people on hand, including such notables like Chris Cormier, Shawn Ray, Mike Christian, Vince Gironda, Michio Grubbs, Craig Titus, Garret Downing, Mike Matarrazzo, and Jeff Poulin. The emcee even went as far as predicting that Chris Cormier will win the IFBB Night of Champions event in New York in May. The evening presentations went as follows. The first part was introduction of all 23 competitors, second part was the routines of the athletes, complete with music and theatrics, and the final part was the selection of the top 10, narrowing down to the winner. Porter Cottrell was disqualified for failure to appear at award presentation, while Jerry Rodger was disqualified for failure to take the drug test. According to Porter, he did not hear the judge announced his name and went to the dressing room to change. Four athletes were disqualified for testing positive in the drug test for diuretics. They were Alq Gurley, B.J. Johns, Gunter Schlierkamp, and Max Shamaya. It was a hard fought battle, and the only major audience clash with the judges was that Aaron Baker should have placed third instead of fourth over Ronnie Coleman. The biggest suspense of the night was the final moment between Lee Priest and Flex Wheeler. Would Wheeler win the third Iron Man in a row or lose to a 217 pound 5 foot 3 inch, completely muscular Lee Priest? We now know the answer! It was FLEX WHEELER.